Low height for a child’s growing posture. 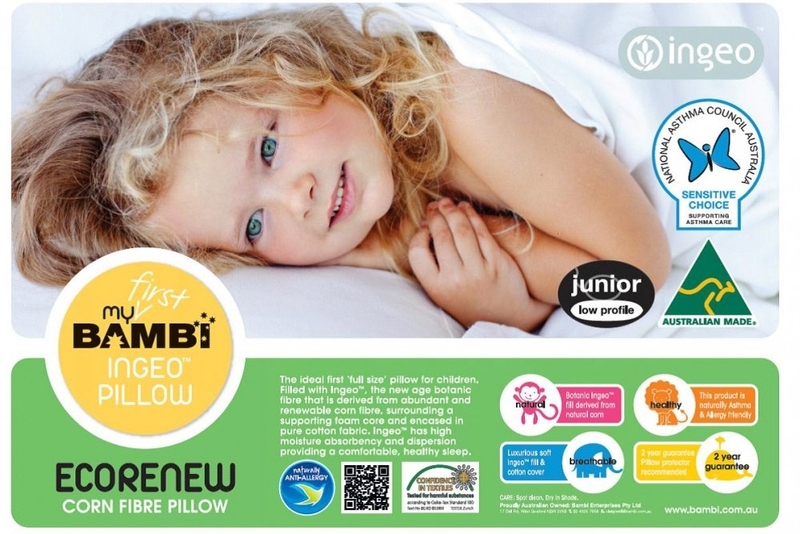 My First Bambi Junior Pillow is the ideal first “full-sized” pillow for children. With a low profile (10 cm) it is the perfect height for children. Filled with Ingeo, the new-age botanic fibre that is derived from abundant and renewable corn fibre, it is surrounded by a supporting foam core and encased in a pure cotton cover. Ingeo has high moisture absorbency and dispersion providing a comfortable, healthy sleep. The pillow is endorsed by the National Asthma Council Australia and is proudly made in Australia. The revolutionary Ingeo™ natural fibre pillows come about via a technological breakthrough. They are made from brand new man-made fibre derived from abundant and annually renewable natural raw material... like corn. Ingeo™ can easily and efficiently be reproduced with limited impact on the earth’s natural resources. The fibres breathe naturally for freshness and comfort and they are naturally hypoallergenic and anti-bacterial. Don't let your allergies prevent you from getting a good night's sleep. This pillow is suitable for Allergy and Asthma sufferers. For more than 30 years, people Australia-wide have indulged in the quality and comfort of quilts, pillows, and mattress protectors from Bambi, a family-owned company and a proud member of Australia Made. More than 50% of Bambi products are made in Australia, and every piece features the quality and innovative craftsmanship consumers have come to expect.